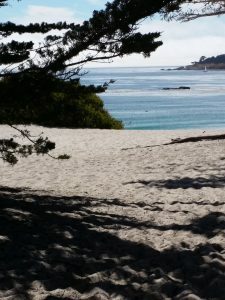 Carmel Beach, CA: A Must-See! We were so excited to get down to Carmel Beach when we got into town. Kev had been here before and just knew I would love it and the town of Carmel/Carmel-by-the-Sea. He was absolutely right, I fell in love with all of it. Carmel Beach is at the very end of Ocean Avenue. The walk to the beach from the Monte Verde Inn, where we stayed was all downhill. The climb back up was crazy but so good. The sand was a blanket of white and was clean. The beach was beautiful, dog friendly and it was ‘cold’ enough that there was not a noseeum in sight. The noseeum sand fleas really do a number on me but Kev knew I wouldn’t have a problem because it wasn’t hot. The weather was beautiful but not hot enough for my bug friends. We took the scenic drive on Scenic Road which was beautiful but next time we will walk there so we can take the stairways to the beach and take our time looking at the beautiful homes that look over Carmel Beach. You can walk to Carmel River Beach and take in views of Point Lobos and Pebble Beach. There were a lot of surfers and kids swimming when we were there. It wasn’t THAT warm but it looks like they were all having a blast. There was plenty of parking (we walked) and restrooms. And a cool looking tree plus wooden walkway to an overlook where we took many pictures and videos. I can definitely see Carmel Beach, CA as a great place for a small intimate beach wedding. Should you want to have a larger gathering of 50 or more people you’ll need to get a Special Event Permit and other documents that are required by the City of Carmel-by-the-Sea. 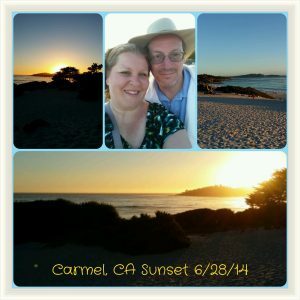 Sunrise and sunset at Carmel Beach was beautiful. I hear you are supposed to be able to see wildlife like sea lions, otters, dolphins and humpback whales just off the beach. We didn’t experience that while we were there but I definitely want to go back! 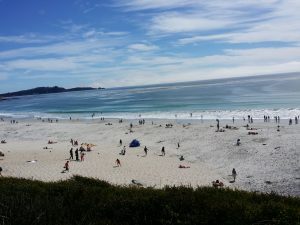 Have you ever been to Carmel Beach?